Let's take a look at the interface of our Link Manager. On top of the interface you can see the last update date and alerts for link data within this campaign. 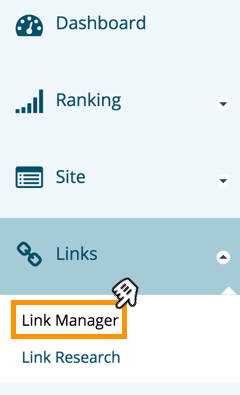 In the top right there is a + icon button which allows you to manually add links to Link Manager. Domain authority - This is the Domain Authority for your own site. Below the charts, you will see an expandable filter which allow you to use different statements to limit the backlink being shown in the table down below. Learn more about Backlink filters. View Options - By default only the most important data points are shown in the table, by selecting extra fields with the button, you will be able to see lot more data about each link. Learn more about link data points. Link URL - Clicking onto the URL of each backlink will take you to the link detail page showing you even more data about this backlink. Learn more about Links Details here.